The Mini AC Power Adapter Hidden Spy Camera features an embedded time and date stamp on the video, so you'll know exactly when your video files are recorded. Connect the Mini AC Power Adapter Camera to your computer's USB port with the included USB cable. If the device is properly connected, the corresponding drive will be listed where it says "Devices:". For example, in the image above, the connected camera corresponds to the "E" drive. To update the time, click "Update" as pictured above. 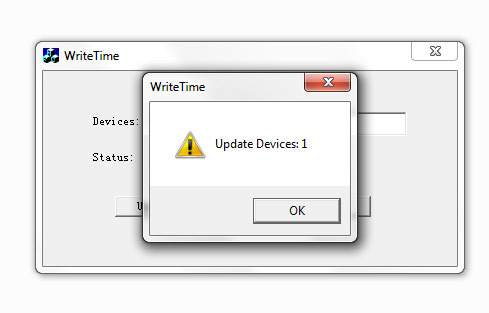 Click OK, then close the WriteTime program, and the time setting process is complete. The new time/date stamp will be applied to all video files recorded from this point on. 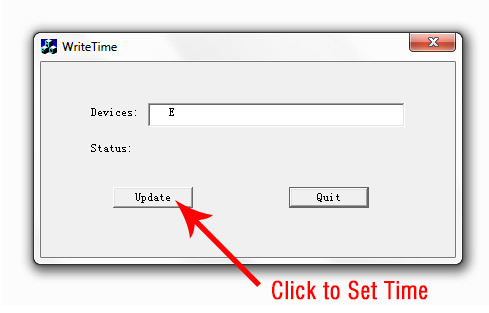 The second method for setting the time/date stamp is by manually setting the current time and date using a text file. This method is useful if you can't get the WriteTime.exe program to work, or if you have a Mac computer (which isn't able to run the WriteTime file). The time in the file is in the following format: YYYY-MM-DD HH:MM:SS. So in the example file above, the date and time would be December 19, 2014, 8:08PM (and 29 seconds). Please note that there is a space between DD and HH, and that the time is in 24-hour/military-time format. 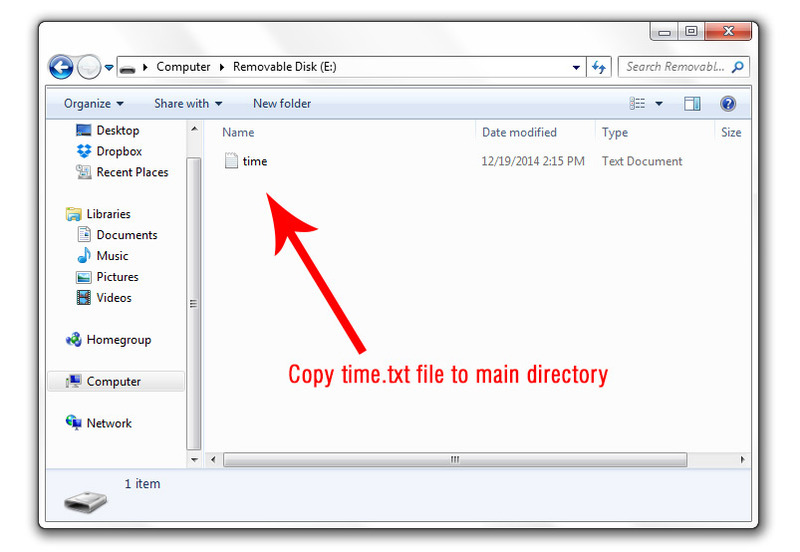 After you've updated the time file with the current date and time, save the file, and close it. Next, connect the Mini AC Power Adapter Camera to your computer using the included USB cable. Once you’ve copied the file over to the camera drive, close the window, and disconnect the AC Adapter Camera from your computer’s USB port. The time/date stamp will be applied to videos recorded from this point forward. NOTE: If the time/date stamp process is completed successfully, the “time.txt” file will be automatically removed when the camera records it’s next video file. If the time/date stamp doesn’t apply, or if the file is still there, please check to make sure that the time setting process was completed properly.